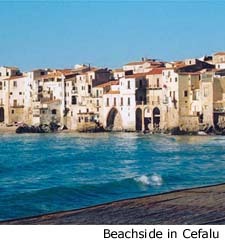 After exploring Palermo and Mondello we drove east to scout out the medieval town of Cefalu. Built on steep, rocky cliffs around a 12th century cathedral, the intriguing town is packed with narrow streets that empty out onto the main square. The colorful, old fishermen’s quarters - where the film Cinema Paradiso was shot - is filled with brightly painted houses on the edge of the Tyrrhenian Sea. Cefalu is home to Norman monuments, Baroque facades, medieval fountains, Byzantine and Greek ruins and a prehistoric temple that dates back to the 9th Century BC, a good sample of the many types of architecture found across the island. With only a couple of days to explore Sicily, we moved east across the island to the coast of the Ionian Sea, dividing our remaining time between the city of Catania and the coastal towns of Taormina and Messina. 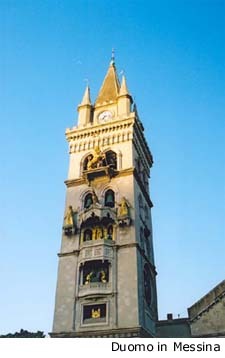 The area between Palermo and Catania is mostly farmland with rolling hills and pastures of sheep and goats. The springtime wildflowers were in bloom and we saw hills blazing with poppies and geraniums. Wheat fields seemed to stretch across the plains while orange, lemon and almond orchards covered the hills. Ancient vineyards and olive groves coated the more arid hills and the ochre tones of the country reminded me of the strong, earthy Sicilians. The communities found in the interior were traditionally based on farming and in the past the landscape was often characterized by large estates owned by the nobility. This pastoral existence is still present in many parts of the interior. 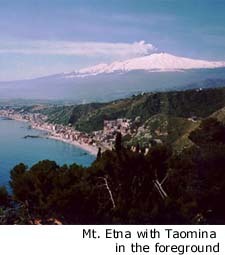 Just before we arrived in Catania we rounded a bend and saw snowcapped Mount Etna rising 3,342 meters above the sea. Lodged between the sea and the slopes of Mount Etna, the city of Catania was completely leveled by an earthquake in 1693 and has been rebuilt over the years with wide, straight streets and Baroque- style architecture. 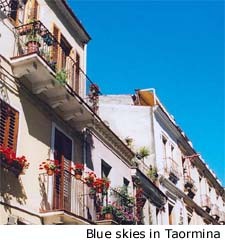 The highlight of our trip was our visit to the pedestrian village of Taormina. When we were there the lemon and orange trees were in bloom and the communal gardens on the cliff were alive with flowers. The air was filled with the scent of rosemary and lavender. The town has a cable car that takes you from the pastry shops and cafes down the cliff through brilliant bougainvillea to the beach below. Located on a craggy bluff above the sea with the mountain behind and sea below, this resort town has been a popular summer residence of European aristocracy for centuries. Greek temples, Norman castles and an ancient theatre all provide a magnificent backdrop for breathtaking views of the sea. We visited the nearby Villa Olmo, a beautiful, eight-bedroom house owned by Italian nobility. The huge front doors open to a long foyer with high ceilings and an appealing decor. At the end of the hallway you have a view of the garden and sea beyond. The spectacular house has a hidden pool and is encased in the scents of rosemary, lavender and lemon. At the end of our trip we made a short visit to Messina, a seaside town perched on the northeast corner of the island. Our last evening we spent in Sicily was a magical one. We were invited to dinner at our host’s parent’s home in Messina, joined by almost 20 family members from three-generations. After a enjoying a cool drink, we were offered antipasti of local cheeses, fresh bread, olives and olive oils along with tiny zucchini mousse served on a platter. This was followed by homemade pasta, slices of browned beef rolled very thin and stuffed with garlic breadcrumbs, a fennel salad and smoked, baked ricotta cheese. Just when we thought we couldn’t eat another nibble, we were presented with a beautiful box of vanilla and chocolate cannolis – the best cannolis I have ever had. The meal was exquisite and the company and conversation splendid. The home looks out over the sea and we could see the lights of the Italian mainland twinkling on the opposite shore. How wonderful to be welcomed into our new friend’s home and made to feel so special. It was an evening that I will never forget and I'm sure that they will not either.